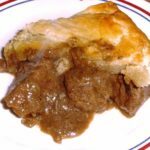 The best steak and Guinness pie, ever! 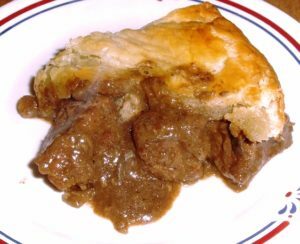 In nearly every restaurant kitchen that has been touched by The Big Dream Factory, you would have found a steak and Guinness pie. 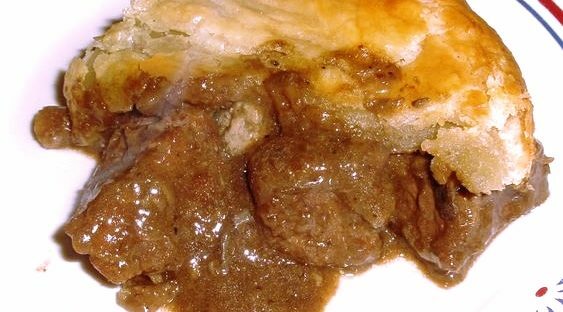 This is arguably one of the most famous meat pies that you will find on the menu in Britain. Slow cooked beef in rich gravy, surrounded by pastry and served with piles of vegetables. The British would call that the perfect lunch or dinner! Heat the oil in a large frying pan until it’s quite hot. Add the steak a handful at a time and brown on all sides – the meat should sizzle when it goes in. Remove the beef and place into a slow cooker (Dutch oven). Lower the heat in the pan and add the onions stirring until they soften. Add the Guinness and bring to a boil, stirring to clean the bottom of the pan. Pour everything over the beef. Add the salt, pepper, chocolate, thyme and butter. Give everything a good mix and bring to a boil. 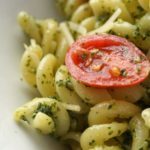 Reduce the heat and continue to slow cook for 2 hours. At the end add the cornflour and stir it all immediately and continue to cook until it thickens. Check the seasoning then allow it to cool. Pre-heat the oven to 185 C / 365 F.
Half the ingredients for the pastry and work in two batches. In a mixing bowl, working with half of the pastry ingredients, sieve the flour and add the cubed butter. Working with your finger tips, form into breadcrumb consistency before adding the water a little at a time until you have a firm dough. Roll and the dough and line the baking tray, bottom and sides. 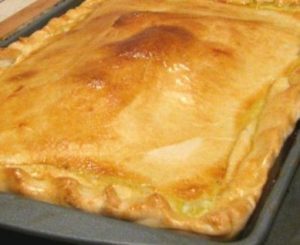 Place in the fridge for 20 minutes while you prepare the next batch of pastry for the top. Roll it out and put it into the fridge until you are ready for it (we roll it around the rolling pin and leave it like that). Fill the pastry case with the cooled steak and Guinness pie filling. Top with the pastry and seal the edges. Make a couple of small holes in the top, then brush with the egg yolk. Place in the centre of the oven for 45 minutes until the pastry is golden brown. If the pastry browns before you think the meat is done, place a sheet of foil loosely over the top and continue to cook.